Amazing as it sounds, a helicopter landed on Fajada Butte in Chaco Canyon on June 13 - a completely unauthorized act on an important and protected historical site. In John Sefick's video, Eleanor Bravo interviews G.B. Cornucopia, Chaco ranger, who saw the whole thing, and took photos and video. I followed up with Chaco staff, and learned that the pilot was under contract with the BLM to fight fires in Wyoming. He was on his way there from Texas. He says the brief landing on Fajada was because he had to complete a "pinnacle landing." Fajada is a high butte, but not a pinnacle. Besides, it is a protected site in a national park and World Heritage site! I would expect that anyone would know this is not a place to land a helicopter on a whim, and without authorization. The pilot is no doubt in deep trouble. As G.B. says in the video interview, Chaco law enforcement was able to track him down shortly after the landing. He will be fined for landing without permission, and hopefully will be cited for ARPA (Archaeological Resources Protection Act of 1979) violation. G.B. is trying to get him cited on additional penalties. Fajada Butte is the home of the Sun Dagger, an important astronomical site. Even Chaco staff have to jump through hoops to obtain access to Fajada or the Sun Dagger site. The hope is that irreversible damage has not been done to any of the sites on top of Fajada by this senseless act. I will keep you posted of any further developments. Once the sun reached its solstice marker at Casa Rinconada, Cyrus and the Acoma dancers (Cyrus Concho and the Acoma Sky City Group Dancers) sang and prayed and danced, greeting the sun, praying for all living things. They did as their ancestors did. We were the guests, feeling welcomed and in the presence of the ancient ones. As the sun rose, the moon set. The moon was just past full, shining brightly over the mesa to the south of the great kiva. There is something about seeing the moon, full and plump in the sky, that takes my breath away. The solstice sun has risen, and begins its journey southward once again. All is well with the world. Solstice sunrise at Casa Rinconada was glorious. "Solstice" means "sun stand still." The sun rises at its most northern point on the horizon, virtually in the same spot for several days. For that reason, we were allowed into the loop road for three consecutive mornings to view the sunrise at Casa Rinconada, giving those who cannot attend on solstice day the chance to also experience the solstice event. Because the volunteers were there (really) early, we got to see the Acoma dancers preparing in the pre-dawn cold at the parking lot. The sight of those adorable children, dressed in their traditional dress, smiling, excited, and trying to stay warm, was absolutely precious. The Acoma dancers (Cyrus Concho and the Acoma Sky City Group Dancers) greeted visitors with songs and drumming on solstice morning as they walked up to the magnificent great kiva in silence. Even though I was still down at the road, helping to greet and park visitors, I could hear the drumming at the kiva, and felt at peace and happy. As G.B. Cornucopia reminds us, for most, summer solstice is simply another date on a calendar. For the ancient peoples, it was much more, signaling the start of the sun's journey back to the south, and helping to guide their activities. They knew every movement of the sun, for it was linked to their survival. 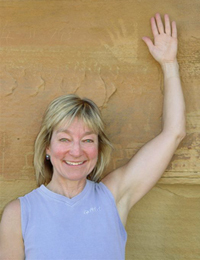 For those of us who stood at the edge of the kiva (see photos above), watching the sun's light appear over the northeastern horizon, then slowly making its way across the kiva's western wall, and into a special niche, solstice is an event we have experienced (see photos below). We watched in awed silence. We felt its sacredness. We felt a kinship with the ancient Chacoans. 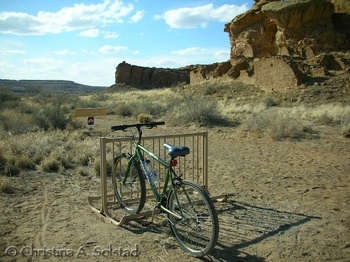 Did you know that you can ride your bicycle at Chaco Canyon - and how much fun it can be? My first bike ride at Chaco was earlier this month (April). It's hard to believe I had not jumped on a bike before. I loved it, and got a great workout to boot! I rode the loop road, and to Casa Chiquita (where you must leave your bike and continue on foot - see photo). Next time I'll head to Wijiji. Being on a bike provides a completely different experience as you explore Chaco. I loved feeling the wind on my face, hearing the birds, feeling the quiet. And I felt closer to the Chacoans. Get a great workout. The paved loop road is 9 miles, plus the distance to and from the campground. The dirt roads provide even better exercise. Feel more connected to what is around you. Amazing what a difference it is to be on your bike versus in the confines of a car. Feel the wind and sun on your face. Hear the sounds of nature - and the quiet. Ride, rather than walk, the dirt roads to Wijiji and Casa Chiquita. Both are fairly short, easy, level rides (1-2 hours), though can have areas of thick sand. For more experienced mountain bikers, try the ride to Kin Klizhin, a 24-mile roundtrip ride from the visitor center to a site outside the main park area (5-6 hours). It's on a deeply rutted 2-track road that can be a challenge even for 4-wheel-drive vehicles, so beware!